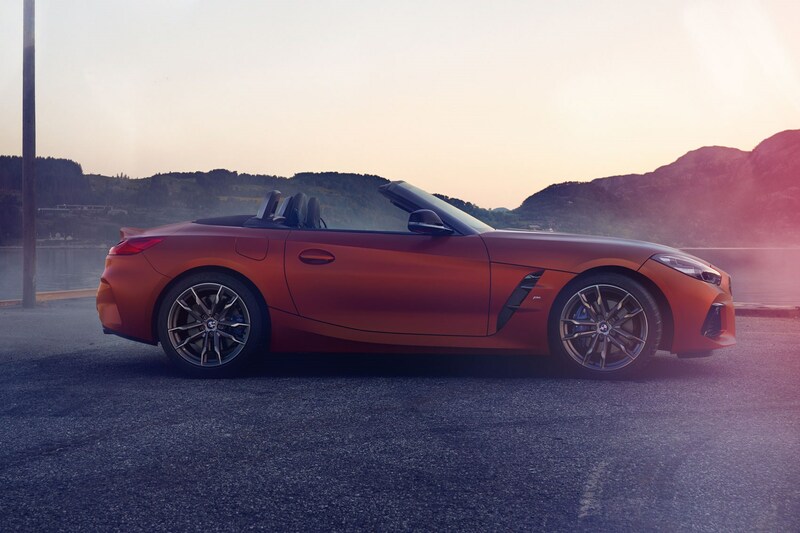 This all-new, 2019 BMW Z4 Roadster is here. We’ve had an early chance to poke around the car during a studio shoot, and we’ve driven the car in prototype form. On this page, you’ll find everything you need to know about the new Roadster; from driving impressions to interior feel, tech specs and much more. Read on for your guide to the M40i First Edition – the top-spec launch-special Z4 that takes aim at the 718 Boxster S. Keep reading for everything you need to know about the new BMW Roadster. Unlike the previous Z4, this one will only be available as a soft top, with no retracting hardtop version in the pipeline right now. That’s partly because it shares a platform with the forthcoming Toyota Supra coupe; to prevent cannibalisation of market share, the two body styles will remain separate. 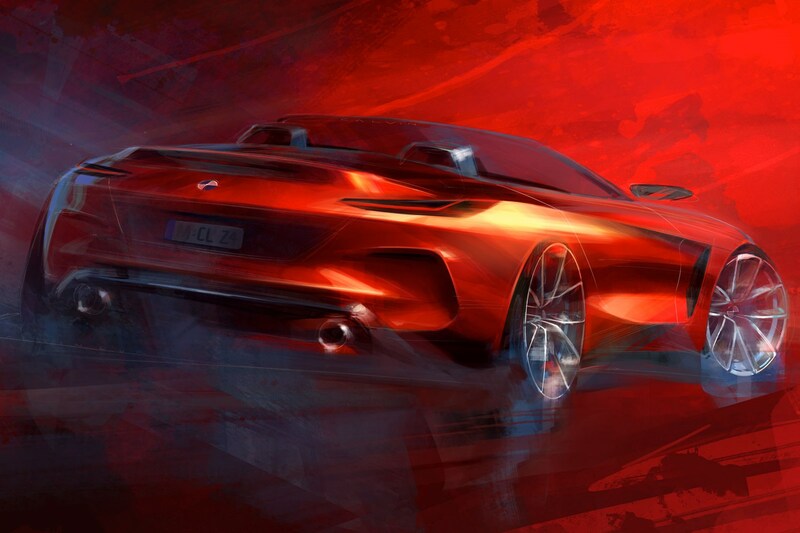 Looks-wise, the new BMW Z4 appears startlingly close to the concept. The double-stacked LED headlights and new mesh grille design remain from the concept car, and there’s a radar for the rudimentary driver-assistance systems hidden behind a cowl on the left-hand side to keep it hidden from view. We’re told this is in keeping with BMW’s philosophy that the Z4 is a drivers’ car, so any assistance should be kept under the radar. At the rear, the L-shaped light clusters have a fluid shape to them, much like the i8 and yet also harking back to the Z8 and other BMW’s of yore. They’re less fussy than the original concept’s, though. A darkened brake light sits under the rear ‘ducktail’ spoiler, while reversing lamps and foglamps sit just above the rear diffuser. As on the previous Z4, the long bonnet is a clamshell that lifts to reveal an engine sat around two thirds of the way behind the front axle. Its side profile features fewer lines than we’re used to from BMW, and more use of twisting surfaces to create shadow. The windowline of the car is high relative to the driving position, which has the effect of making the driver feel very low down towards the tarmac. The wheels you can see here are 19-inch items, which will be standard on the M40i, shod in Michelin rubber and sat in front of M Performance brakes. 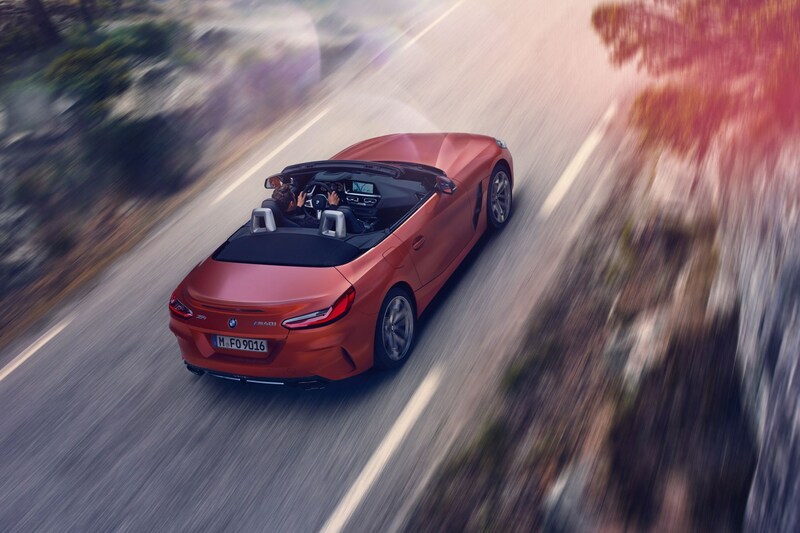 What about the cabin design of the 2019 BMW Z4? 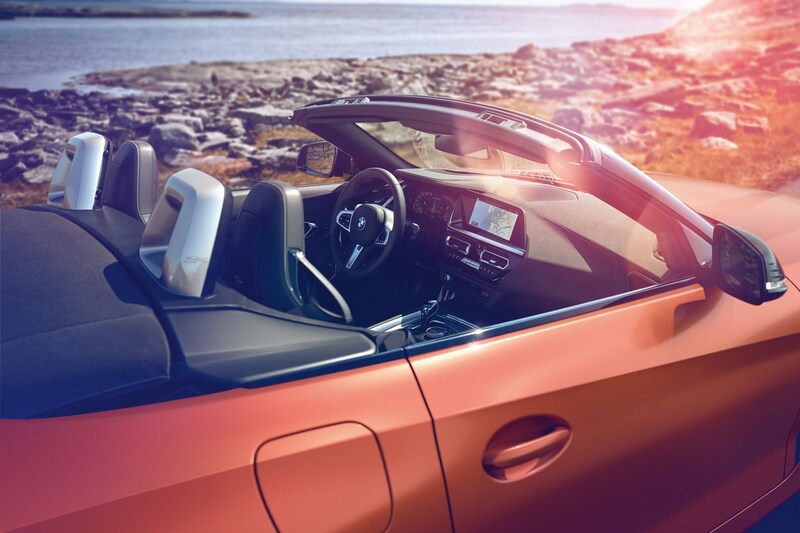 The images also show us the interior of the new Z4. 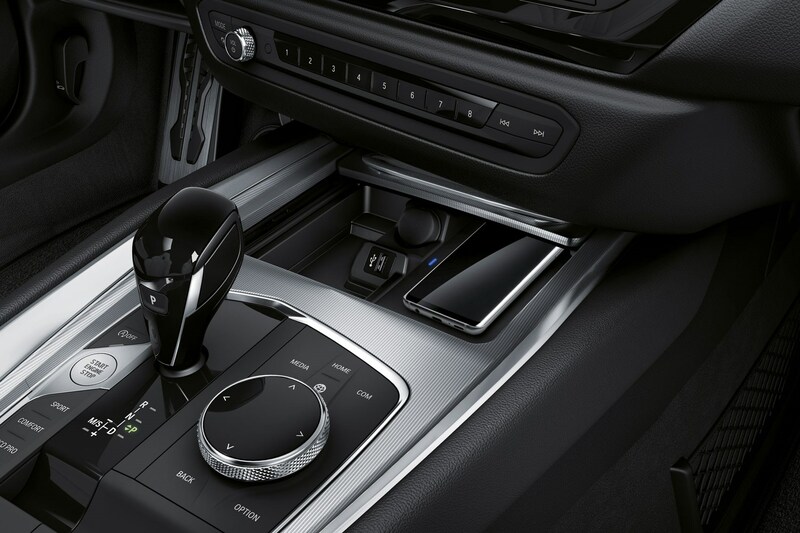 Inside, you’ll notice all the driving controls face the driver, while there’s some neat bevelled metal finishing around the air vent adjusters and iDrive 7.0 rotary controller in the same style as the current 7-series. 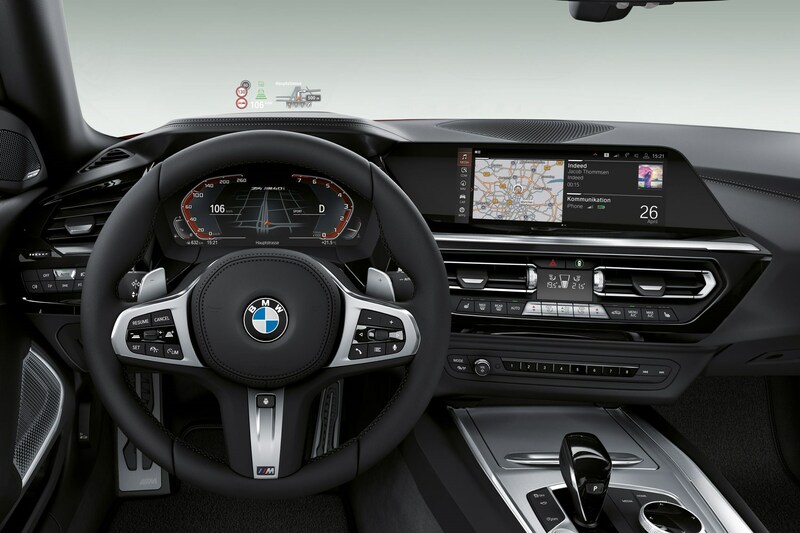 The iDrive’s output is displayed on a 10.2-inch screen, with another of the same size taking the place of a traditional instrument cluster. Opening the door presents you with a very wide sill, over which you step to access the thin but electrically adjustable seats. Behind these lie two speakers for each occupant, which forms part of an optional Harman Kardon surround sound speaker system. A head-up display is a first for a BMW roadster, too. What about the 2019 Z4’s fabric roof? The roof folds open and closed in 10 seconds at speeds up to 31mph, but why fabric rather than a folding metal hard top? Andreas Ederer explains: ‘it’s lighter, it lowers the centre of gravity and it enables us to have the full trunk volume whether the car is open or closed. The soft top technology in terms of acoustic comfort is even better than the retractable hardtop we had on our predecessor, so therefore there is no reason whatsoever to go for another hard top. Said luggage volume is a useful 265 litres, up from 180 in the previous Z4 and apparently big enough for a pair of golf bags, should that sort of thing flick your switch. 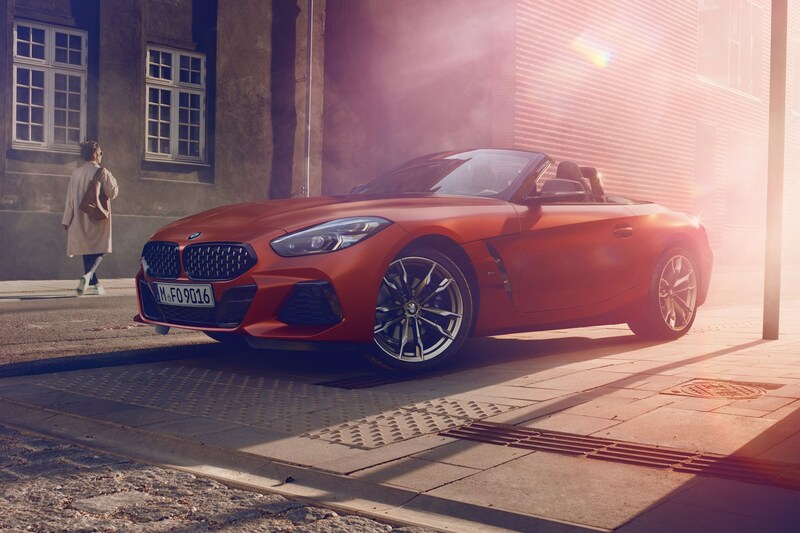 The only version of the new Z4 we’ve encountered so far is the halo M40i, and this comes with Munich’s B58 straight-six engine, a turbocharged 336bhp, and one in the eye for Stuttgart: it’s been tuned with the old Boxster’s nat-asp throttle response as a benchmark. Expect 0-62mph in 4.6 seconds. It’s coupled with an eight-speed automatic gearbox including paddleshifters on the steering wheel, and there are Comfort, Sport and Sport+ modes to pick between – though these have more relevance to the handling, covered below, than the performance. With 50:50 weight distribution thanks to the engine’s location (around two third of it is behind the front axle), MacPherson struts up front and a multilink rear end, the recipe is there for a half-decent sports car. In addition, the M40i gets electrically controlled adaptive dampers and differential, with the latter similar in design to the M5’s and using identical software logic. You can read a full evaluation in the prototype drive, but suffice to say there’s a huge gulf between Comfort and Sport+, with decent capability both as a GT cruiser and a tyre-shredding track terrorist. The main feature that impressed us was the turn-in, which can range from lackadaisical to pin-sharp depending on your mode. Will there be other versions of the 2019 BMW Z4? Absolutely – we’ve been led to believe we’ll see 20i and 30i versions, both using a 2.0-litre, four-cylinder ‘B48’ motor, and perhaps a manual gearbox for the 20i as we spotted testing. This last isn’t for performance, but rather to lower the base list price. BMW is remaining tight-lipped on any details of these models at this point, however. We’ll have to wait until September 2018 for further details of the whole range. 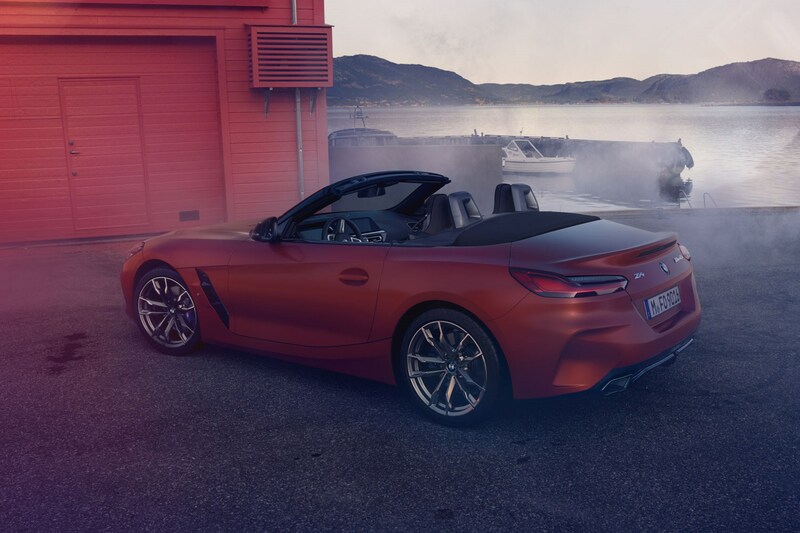 How much will the 2019 BMW Z4 cost and when will it be launched? We’re expecting the M40i’s base price to slot neatly between 718 Boxster and Boxster S, which pegs it around the £48-49k mark. We’ll see the car again at the Paris motor show, and it’ll hit showrooms in spring 2019. How about another BMW Z4M? Since we’ve already seen a racing concept of the Supra, it’s fair to assume Toyota’s taking the motorsport lead on this project. What’s this about the new Toyota Supra? Sports cars don’t make the financial sense they used to, and that means more and more car brands are teaming up to produce them. Toyota did it with Subaru for the BRZ/GT86, and this time the Japanese giant is teaming up with BMW. Although undertaken to increase efficiency and keep down, the cars only share six main areas of parts; the engine, transmission left and right wing mirrors, and two other things. The rumour mill suggests BMW and Toyota may soon announce an extension of their agreement, this time to include a joint, low-cost, front-wheel drive architecture to underpin future city cars, such as a baby Mini and next Aygo.